Philadelphia Union made a move in today’s half-day trade window, acquiring a second-round pick in the 2019 MLS SuperDraft from Chicago Fire in exchange for the rights to Fabian Herbers. 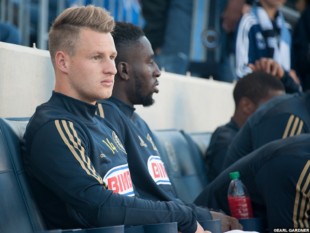 The Union declined Herbers’ option following the 2018 season. A press release issued by the Fire indicated that they had picked up that option. Philadelphia drafted Herbers with the sixth pick in the 2016 SuperDraft. He put together a strong rookie season in a supersub role, scoring 3 goals and adding 7 assists in 32 matches. Injuries, however, derailed his 2017 season, and Herbers never returned to form or favor, managing just 1 goal and 2 assists in 21 games played over the last two years. Herbers did contribute to Bethlehem Steel’s playoff run, scoring 5 goals and 4 assists in his appearances for the Union’s affiliate side. While draft picks are not a guaranteed source of talent, it counts as a good piece of business for Ernst Tanner to pick up a draft pick in exchange for a player the club were ready to part ways with. The Union now have five picks in the SuperDraft, including three in the first two rounds: their own first- and second-rounders (#13 and #37) and Chicago’s second-rounder (#29). The next event in MLS’s busy offseason is the expansion draft for FC Cincinnati on Tuesday afternoon, in which the new club will choose five players from other MLS sides. Free agency will follow immediately. Best to Herbers. I still remember his excellent first goal for the Union, a nice curler to the far corner. I thought he’d be a bigger contributor ut never found his place on the team.